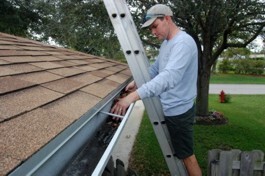 Cleaning Gutters and Downspouts is vital. Why? Over time debris in the form of leaves, shingle granule, dirt and concrete tile build up and need to be removed. 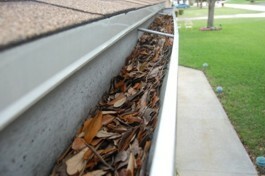 Keeping Gutters and Downspouts clear and free of debris will allow water to flow properly. We have the experience to identify and resolve potential problems before they become expensive repair issues. We	have seen many times where clogged gutters and downspouts have lead to rotted fascia, foundation leaks and roof problems. We are Fully Licensed and Insured, Highly trained Professionals. We are a Family Owned and Operated business that has been providing On time Service since 1994. When it comes to working on Gutters and Downspouts, we have the experience do the job right......Please be safe, leave it to a professional. Cleaning of your gutters can include,scooping out by hand, blowing out with a blower or using water from a hose.This can be a messy job, but don't worry we'll clean up after ourselves!